Watching baseball is one of the fun things to do in Seattle while visiting so be sure to check the Seattle Mariners season schedule. July in Seattle has beautiful sunny weather. The day I visited the Pike Street Public market was warm and everyone had a great time outdoors. The Pike Street Market district was unknown to me until I saw the Meg Ryan-Tom Hanks Sleepless movie about 10 years ago. The sign, which even locals call iconic, captured my imagination. Once on the scene, the smells, restaurants, and street singing swung me into a happy mood. This is a fun place and there are a lot of things to do in Seattle while visiting. Purchase this print on 11x17 inch 100% acid free heavy duty premium paper. The image is about 9.5x12 inches. The watermark does not appear on the finished print shipped to your home. Click here for more purchase information of my artwork. The Georgetown DC canal locks are a beautiful urban setting in Washington DC. The classic view of gondolas traveling the Grand Canal near St. Mark's Square has been a popular vacation filling hotels for hundreds of years. Still life of sunflowers on a small table in a ceramic pitcher. Rendition of a Georgetown Washington DC street scene at sunset on a hot summer day. To check out more artwork by Doug Dourgarian and see more links for his online art gallery click here for his web gallery of art . 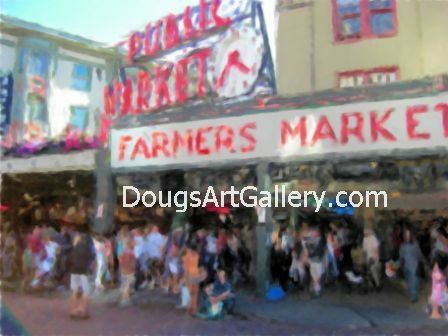 Click here to leave Things to do in Seattle for more links to artists and their online art galleries, art prints and art posters. Browse the links found at the bottom of Home Page. Get the The Seattle Mariners Widget widget and many other great free widgets at Widgetbox!